At the risk of upsetting a certain type of feminist, I’m going to openly admit that I believe in chivalry. And that means more than just holding open doors for women or giving up my seat on a bus. Because of my old-fashioned values, I also believe in helping out when there’s a damsel in distress. 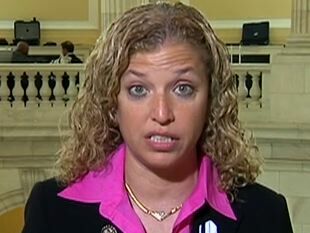 And Congresswoman Debbie Wasserman Schultz is in distress. The lawmaker (who also serves as Chair of the Democratic National Committee) has now been asked two times to explain the difference between a Democrat and a socialist. As reported by the Free Beacon, she gets a deer-in-the-headlights look on her face and resorts to empty talking points rather than giving a real answer. Democratic National Committee chair Debbie Wasserman Schultz (D., Fla.) could not take advantage of a second opportunity Sunday on Meet the Press to explain the difference between Democrats and far-left socialists. Schultz was flustered by MSNBC’s Chris Matthews Thursday when asked the same question during a discussion of the popularity of socialist Sen. Bernie Sanders… Amazingly, despite the clip of her non-answer going viral this week, Schultz gave almost the same answer to host Chuck Todd. He played the clip of her with Matthews and asked her to respond. …Schultz went on to her usual playbook about Republican extremism and that Democrats were the party to help people enter the middle class. Todd, for his part, did not note at the time that Schultz completely failed to answer his direct question. Here’s the video clip if you want to see Ms. Wasserman Schultz helplessly flounder and she dodges the question. And just imagine how much worse it would have been if Todd had been a real journalist and put a stop to her filibuster and actually asked her to answer the question! So, like Sir Galahad from the Knights of the Round Table, I feel compelled to come to the aid of Ms. Wasserman Schultz. When asked again about the difference between socialists and Democrats, here’s what she should say. There’s a big difference. As pointed out by my good friend Dan Mitchell, socialists technically believe government should own the means of production, which means government-owned and operated steel mills, car companies, railroads, banks, etc. Democrats, by contrast, believe in nominal private ownership of the means of production, but with lots of subsidies, handouts, redistribution, protectionism, intervention, regulation, and bailouts. The bottom line is that Bernie may call himself a socialist and his rhetoric may be rather heated, but his views – and voting record – make him a conventional Democrat. See how easy it would be for her to give a good and honest answer. And because of my chivalry, I don’t even expect a $10,000-per-month consulting contract from the DNC. I offer this advice out of the goodness of my heart (and my belief in honest portrayals of economic policies). P.S. I also would advise Ms. Wasserman Schultz not to use Thomas Sowell’s description of the left’s economic views. It’s quite accurate, but the term has a wee bit of baggage nowadays. Should have read the linked Powell article first where Dan mentions fascism. Our current form of government is quasi-fascist, government doesn’t own the means of production but controls the economy through intervention in the form of regulation. Both conventional democrats and republicans lead us away from a tradition of liberty toward an all controlling totalitarian federal government. Combined with strong nationalism, you have three major tenets of fascism. According to this definition, there doesn’t appear to be any difference between the Republicans and the Democrats either as to fiscal matters. And neither seems to have much regard or respect for the fundamental principles that underscore the protection of personal liberties under the U.S. They act as if their Constitutional duties and responsibilities are not part of their job description. For Republicans and Democrats fundamental Constitutional principles are always trumped (no pun intended here) by politics.